James Heselden was chairman of Hesco Bastion and also owned Segway Inc.
Family mourns "much-loved father and husband"
Read more on Segway safety study here. (CNN) -- The owner of the Segway company has died, apparently in an accident involving one of his upright two-wheeled vehicles, police in England said Monday. 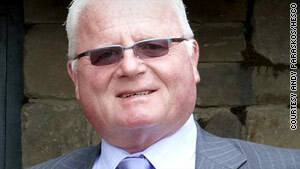 The body of James Heselden, 62, was pulled from the River Wharfe in northern England on Sunday, police said. A Segway-type vehicle was recovered from the river, police said. The incident is not thought to be suspicious, police said. Heselden's family said in a statement that "there is absolutely nothing to suggest it was anything other than a tragic accident. "Our family has been left devastated by the sudden and tragic loss of a much-loved father and husband," the family said. "The exact circumstances of the accident are still being clarified and will, of course, be the subject of an inquest." Heselden was the chairman of Hesco Bastion, a company that manufactures protective walls used by military troops. He also owned Segway Inc.
Hesco Bastion confirmed "with great sadness" that Heselden had died "in a tragic accident near his home." It hailed his charitable work, saying that a donation of 10 million British pounds (nearly $16 million) to a local foundation earlier this month raised his lifetime charitable giving to 23 million pounds (over $36 million). The British veterans' charity Help for Heroes was another beneficiary of his donations, the company statement said.